The (click here for the latest) three sewer RATZ sit in the Senate under a Republican banner, but for all intents and purposes, these three are part of the Republican lunatic fringe who carry water for the Democrats. McCain still has not gotten over his presidential defeat including Trump’s remark concerning his time in Viet Nam. Therefore he has held Trump hostage regarding the rollback of Obama Care. Susan Collins, listen to her for a moment, if you can, will cause you immediate pain. Murkowski, she should not be there. Ted Stevens was the Senior Senator until trumped up charges by Democratic partisans caused him to be arrested and convicted. These charges were later dismissed under appeal, but too late as he lost the Senate seat. Murkowski is now an Alaskan Senator because of that. Republican wimps (RINOs) continue their lying to the American people. They gave lip service time and time again during their campaigns, but when the chips were down they went Yellow Pants. Lisa Murkowski (click here) our number one target, number two is Susan Collins (she is no Ms. America-click here), number three is John McCain(click here). 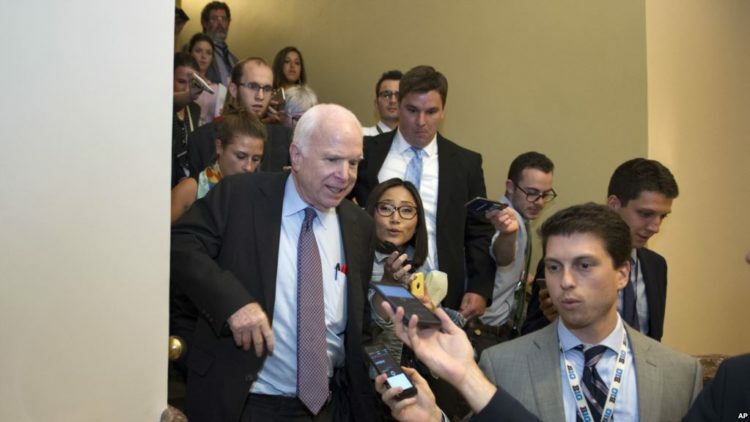 In the past, McCain has repeatedly called for the repeal of Obamacare. But when do or die came, he gave the thumb’s down in this deadly Game of Thrones. It may also be that he hates President Trump so much, he just wants to screw with his agenda. Whatever the reasoning was, it was treacherous. There were literally gasps from the Senate floor when he pulled this. Ted Cruz is right when he says there will be a reckoning and no party can remain in power by lying to those who gave them that power. “From the beginning, I have believed that Obamacare should be repealed and replaced with a solution that increases competition, lowers costs, and improves care for the American people. The so-called ‘skinny repeal’ amendment the Senate voted on today would not accomplish those goals. While the amendment would have repealed some of Obamacare’s most burdensome regulations, it offered no replacement to actually reform our health care system and deliver affordable, quality health care to our citizens. The Speaker’s statement that the House would be ‘willing’ to go to conference does not ease my concern that this shell of a bill could be taken up and passed at any time. Given, the so-called ‘Skinny Repeal’ was awful. But McCain didn’t vote for it because it did not offer a replacement. It shouldn’t have. The reason I didn’t like it was that it would still cause premiums to go up 20 percent. If they had just done Ted Cruz’s actual repeal, we wouldn’t be in this mess. But there are Republicans who want the pork it offers and the kickbacks from the insurance companies after they get their bailout. In other words, corruption.